Axis & Allies celebrates itâ€™s 25th Anniversary in August of 2009 with a new and updated edition of itâ€™s original classic game. 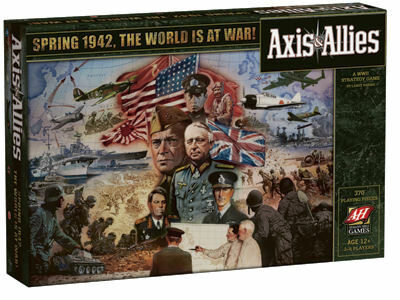 Axis & Allies 1942, designed and developed by Larry Harris, will utilize the updated rules established in A&A Anniversary Edition. Cruiser class ships will make their debut in A&A 1942, forever changing the naval line-up. Newly sculpted playing pieces and all new packaging will position this game as the cornerstone of the Axis & Allies game line for years to come. Decide the fate of a nation in a few short hours! This is a great wargame, it does take a long time to get set up, and there are some rules to learn, but once you get it down its a great game. Great little game! An excellent game for introducing folks to the wider world of Axis & Allies. Rules are well written & easy to understand. Plus this game has the advantage of being the least expensive in the series. This is a strategic war game based on World War 2. It achieves a great level of immersion through its rules and miniatures, but never gets too complicated - a classic.